Locations listed here have agreed to serve as Official Weigh Stations for the Angler Recognition Program. 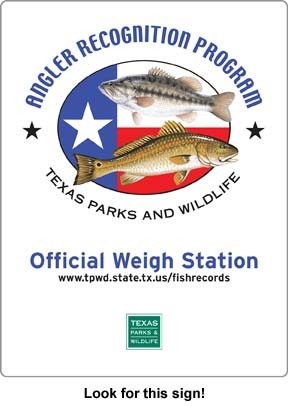 If you don't see an Official Weigh Station in your area, any certified scale can be used to weigh a fish for a record application. Contact a local game warden or check the telephone directory for businesses that have certified scales and may be willing to weigh fish. Places to try include marinas, bait shops, feed stores, recycling drop-off centers, and United Parcel Service or other package-shipping stores. Certified scales (electronic or spring type) have been certified as accurate by the International Game Fish Association (IGFA) or a licensed scales calibration company. * Certified hand-held scales may be used for verifying the weight of your catch if the weighing is observed by an independent witness. If a scale is certifiable but does not have an up-to-date annual certification, an angler may submit proof that the scale was re-certified within 30 days of the weigh date. Do you have a business that would like to be an Official Weigh Station? Use our online form to apply. * The Texas Department of Agriculture does not certify scales. For a list of companies that are licensed to certify scales, visit the TDA website. Select the "Reports & Publications" tab, type "Weights" into the program search box in the right column, and look for the downloadable List of Licensed Service Companies. Gulf of Mexico Nueces Dolphin Docks Inc.